Surprised? Well, you’re not alone. The importance of good posture in an overall fitness program is often overlooked by fitness advisers and fitness seekers alike. In fact, the benefits of good posture may be among the best kept secrets of the current fitness movement. The good news is that most everyone can avoid the problems caused by bad posture…and you can make improvements at any age. Poor Posture? How does it happen? • As more and more cars are crowding our roads, resulting in accidents and injuries; And as we drive in cars with poorly designed seats. 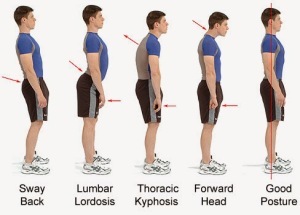 Posture is important to aid in decreasing force on all tendons, muscles, ligaments and joints of the body! 1. Stand with the back of your head touching the wall and your heels six inches from the baseboard. 2. With your buttocks touching the wall, check the distance with your hand between your lower back and the wall, and your neck and the wall. If you can get within an inch or two at the low back and two inches at the neck, you are close to having excellent posture. If not, your posture may need professional attention to restore the normal curves of your spine. 6. Lower back has a slightly for-ward curve (not too flat or not curved too much forward, creating a hollow back). Feel the muscles of your neck and shoulders. Do you find areas that are tender and sensitive? Are the buttock muscles sore when you apply pressure? What about the chest muscles? 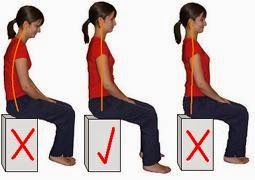 Your posture is important when you do everything in daily life. It can be worked on via specific stretches for your imbalances, strengthening for the specific areas, treatments can help you work towards proper alignment of your body. Treatments such as: orthotic therapy, chiropractic adjustments for the different joints of the body that are affected—from the jaw, neck, mid back, lower back, shoulders, elbows, wrists, hips, knees, and feet. As well the Active Release technique is very effective in decreasing adhesions due to imbalances and so is massage therapy.